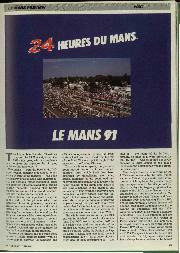 The past is present in any trip to Le Mans for purist pilgrims to the 24 Hours. 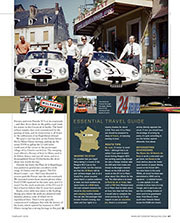 We’ve paused en route at Rouen to discover the glorious old Grand Prix circuit, retraced the original Le Mans course that led into the town itself, then lingered over the racing relics in the museum at the track’s entrance. 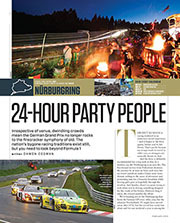 Now we have another must-see diversion that will lure us for an hour or an afternoon during Le Mans week in June. The Hotel de France has always been there. But now it is restored to its charming Art Deco best that made it a popular haven for race teams from the 1950s to the ’80s. 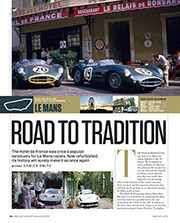 It echoes to the days when drivers took refuge in its serenity, mechanics prepped Aston Martins, Triumphs, Ferraris and even Porsche 917s in its courtyards – and then drove them on the public road ready for action on the Circuit de la Sarthe. The hotel reflects simpler days now romanticised by the passing of time, and its resurrection is all down to the enthusiasm of an Englishman abroad. We paid a visit last July on the Friday before the Le Mans Classic meeting, picking up the scenic D304 to gallop the 25-odd miles south-east of the circuit to the picturesque village of La Chartre-sur-le-Loir. 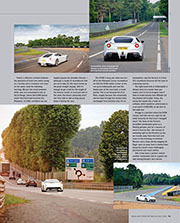 The sweeping road offered a flavour of how Le Mans used to be before Armco and run-off areas, and in a thoroughbred Ferrari F12berlinetta the drive alone was worth the trip. Outside the hotel, the Place de la République was packed as gendarmes corralled a wide range of classics into the square. The F12 doesn’t count – yet – but I was directed to reverse park the Ferrari into the side courtyard. We recreated scenes from ancient photos when Ford GT40s squeezed in the same spot, and if it wasn’t for the stark modernity of the F12 you’d find it hard to believe that 50 years have passed. Inside, every table was taken in the bustling dining area where the walls are plastered with fantastic photos, some of which we’ve reproduced here. There’s even specially commissioned wallpaper that tells the history of the hotel, which opened for business in 1905. 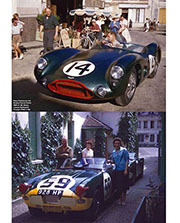 Motor racing has a strong heritage in this part of France. Henry Segrave, who won the 1923 French GP in his Sunbeam on a road circuit north of Tours, dined at the hotel. 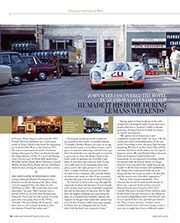 Its reputation for food led John Wyer to the hotel in 1953. He was so enamoured, he made it his home during subsequent Le Mans weekends through the Aston Martin, GT40, 917 and Gulf Mirage years. 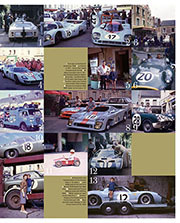 Drivers such as Derek Bell, Jacky Ickx, Phil Hill, Jochen Rindt, Bruce McLaren, Carroll Shelby, Stirling Moss, Jackie Stewart and Mario Andretti were among the many to take a room. Overington would prove his credentials as a potential new owner in suitable fashion. 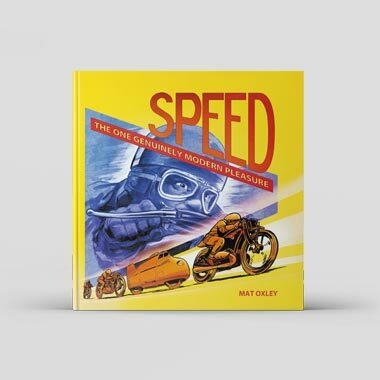 “I bought a Bentley Blower six years or so ago and started racing it at Le Mans Classic, and I guess it must have been four and half years ago that I finished the race and thought it would be a great idea to drive the Blower back to the hotel, with oil spewing out of it! But it got there. It was then that someone said, ‘Look, you really need to do something about this place, you’re the right person to do it’. And after a couple of bottles of good red wine I decided it was a fantastic idea, put the wheels in motion and made an offer. It got accepted, and then the panic set in about what I’d done! Having spent so long working on the sale completion, Overington didn’t waste time on a project that was a “passion” rather a fortune generator. It helped that he’d made his money in exactly this business. Still, from what we saw the Hotel de France is already a ‘destination’ for car nuts, whether they drive Bentleys or Subaru Imprezas, and plans are brewing for special motoring events involving car clubs. Last season Derek Bell drove Overington’s Kenwood-sponsored Porsche 962 on the D304 as a lovely nod to the past, thanks to help from the local gendarmerie, and we can expect more of the same soon, perhaps with a Gulf theme. You can bet the Place de la République will be mobbed on Le Mans weekend in 2015, and demand for rooms will be off the scale. Another option to enjoy the atmosphere at the hotel would be to camp a short walk away with travel experts Speed Chills, which is running one of its superb sites in La Chartre for the second time. 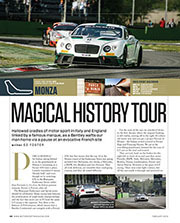 A pleasant and civilised alternative to the usual Le Mans campsites is guaranteed. Beyond the 24 Hours, a visit at a quieter time of year would have its own charms, as Martin suggests. The countryside, towns and villages are a delight in this part of the world, just on the northern edge of the Loire valley. Perfect for a romantic weekend away – with only a tasteful and convenient hint of a motor racing link. We’d recommend it. It’s possible that you might fancy taking in a round of the Peugeot RCZ Cup on the Bugatti Circuit, but the chances are that the 24 Hours will be your primary target. 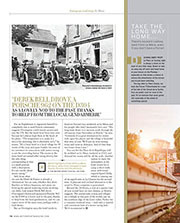 Just as at a Grand Prix, prices escalate when there’s a captive audience in town, but local residents let spare rooms on a B&B basis, the tram network connects the circuit to city-centre hotels and camping facilities abound. You can also find packages that include Channel crossing, race ticket and four nights in a nearby chateau for about £550. 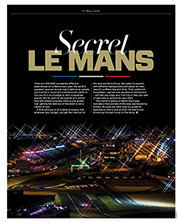 That said, it’s Le Mans: you should be prepared to sleep al fresco, on Saturday evening at least. By road, it’s better to avoid Paris – although that is an option if you want to watch locals forcing Peugeot 407s into parking spaces big enough for only a Twingo. Instead, take the A16 west from Calais and thread via Boulogne towards Rouen on the A28 and then south on the A11 to Le Mans – allow about 3hrs 45min for the trip. The alternative is to travel to Paris by air or train, then catch a TGV from Montparnasse to Le Mans: that bit takes about an hour, less than half the time it would take to complete the same journey by car. If you happen to own an executive jet, there is a convenient airstrip directly opposite the circuit. If ever you should have the privilege of arriving by plane, it’s quite something to see the familiar asphalt silhouette from above. The Musée des 24 Heures du Mans is worth a visit when you get there, but Rouen is the most obvious place for motor sport tourists to pause. Racing ceased at the French GP’s five-time home in the early 1990s, all circuit furniture was demolished in 1999 and its signature – a cobbled hairpin – is now asphalt. It is still possible to drive most of a lap, though, and in parts you can see the crumbling remains of what used to be grandstand steps. From Rouen, head south-west towards Elbeuf, locate the D938 and dream. 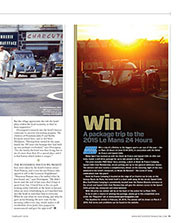 Win a trip of a lifetime to the biggest sports car race of the year – the Le Mans 24 Hours on June 13-14 2015, in association with the Hotel de France and Speed Chills. 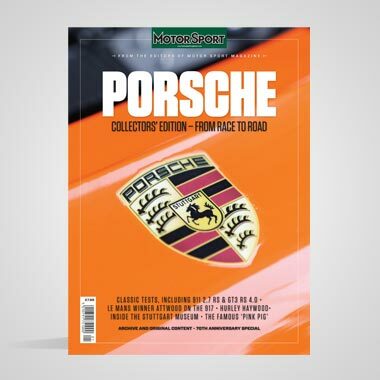 Motor Sport has teamed up with the Hotel de France and Speed Chills to offer one lucky reader a self-drive package for up to two people to the race. The prize includes P&O Dover ferry crossing, a pitch at Hotel de France Camping, Speed Chills Club Membership, circuit parking and up to two general admission tickets. The winners will also receive a complimentary dinner on the Saturday night of the race weekend in the hotel’s restaurant, Le Relais de Ronsard – the scene of many celebrations over the years! Hotel de France Camping is located on the edge of Le Chartre-sur-le-Loir, on the famous Route du Mans; the hotel itself is a short walk away. At the circuit, Speed Chills Bleu Sud Private Camping is conveniently located near the Maison Blanche entrance to the circuit and Speed Chills Club Membership will give the winners access to the Speed Chills private bar, restaurant and entertainment. 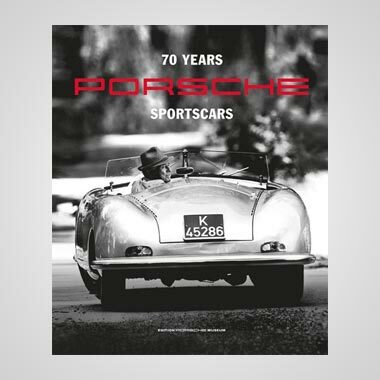 With this prize our winner will be at the heart of the action for Le Mans 2015. The deadline for entries is February 28 2015. The winner will be drawn on March 2 2015. Full terms and conditions can be found on the website. Dashing away from Le Mans on Sunday night is always a chore on the back of very little sleep. Better to take an extra day off work and head home at your leisure on the Monday – especially as that allows a chance to retrace the wheeltracks of the heroes you’ve just been watching. The day after Le Mans Classic, we took the Ferrari F12berlinetta for a tour of the bits of the Circuit de la Sarthe that are public road for most of the year. It’s an exercise that never grows old, especially at the wheel of something special. There’s a delicious contrast between the spectacle of hard-core motor racing on a Sunday and a mundane rush hour on the same roads the following morning. We join the circuit between white vans and articulated trucks at Tertre Rouge, where the D338 passes under the D323 and becomes the Mulsanne. In traffic conditions we can happily bypass the dreaded chicanes – although a couple of roundabouts that are not in play for the racers break up the great straight anyway. Still, it’s enough to get a feel for the length of the famous stretch of road and take in the views the drivers absolutely don’t see from side to side as they pound down it during the race. The D338 is busy, but when we turn off at the Mulsanne Corner roundabout we find the D140, better known as the run up to Indianapolis and now the fastest part of the race track, is much quieter. This is my favourite bit of Le Mans, largely because this remarkably narrow blast through the woods looks unchanged from previous eras. It’s so atmospheric and the Ferrari’s 6.3-litre V12 soundtrack bounces off the trees in a pleasing manner. The right-hand kink at Indianapolis is always more of a corner than you expect and it’s fun to imagine how it feels to brake heavily from 180mph for the banked left-hander. Today, the racing line would risk a head-on collision, which would be unfortunate in a car worth £240,000, so we stick to the wide line. Arnage is a junction where the D139 crosses and here we turn right for my other favourite bit that hasn’t changed much. The force of the Ferrari’s incredible acceleration gives us a fleeting glimpse, just for a second, of what it must be like… But instead of sweeping right at the Porsche Curves, we trundle away from the track and down to the following roundabout. Barriers and a chap sternly wagging his finger warn us away from a cheeky blast along the circuit’s most challenging permanent race-track section. Still, it had been a perfect coda to another memorable visit to a grand old lady among Europe’s race venues.